Need Help Identifying a Song? Here's One Way to Find It. It’s pretty common in music circles to encounter people who have spent literally decades trying to identify an obscure song on an old mixtape. They’ve had no luck Googling lyrics or playing the song into Soundhound, Shazam, or friends’ ears. There are entire communities—on websites like Wat Zat Song?, Midomi, and Reddit—devoted to crowdsourcing the solutions. Many times, without what felt like much work, I’ve been able to successfully ID such songs for strangers. Not because I’m Brainypants McMusicface; to the contrary. In every instance these have been songs and artists I’d never heard (or even heard of) before. But the recordings contained the necessary clues and context, to which I applied some deductive reasoning and research done on freely-available websites. Here’s how I’ve gone about it, in case crowdsourcing isn’t working for you. One example: Slicing Up Eyeballs posted this to both Facebook and Twitter. Can you ID this funky post-punk song taped off WNYU in the ’80s? The post was accompanied by the song’s audio on Soundcloud (and had already been an open case on Wat Zat Song? for over five months). 1. 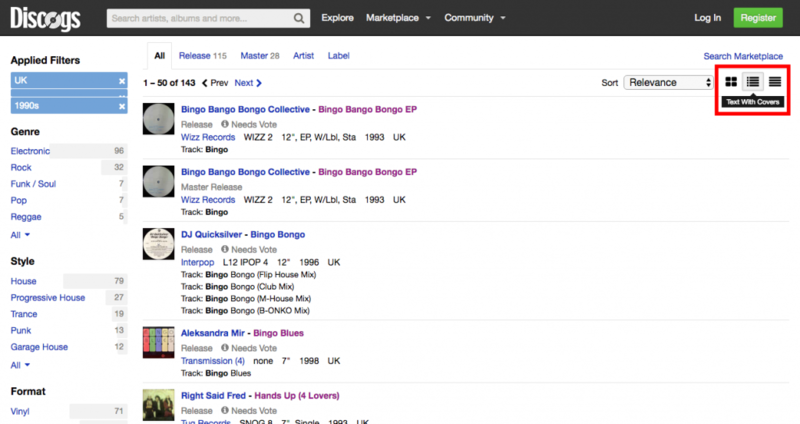 Examine the audio and lyrics for clues, and search for keywords on Discogs. 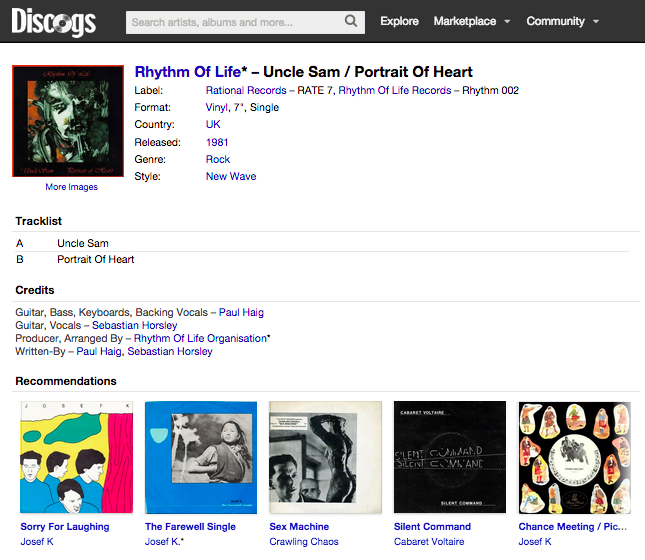 Discogs is a website database detailing musical artists’ discographies and, among other features (like its marketplace and the ability to catalog your entire music collection), it’s a powerful search engine. The Advanced Search, which is free to use without creating an account, allows you to look just within Track (song) Title. Since this song didn’t have a traditional chorus (where the title would usually repeat), I started making out the lyrics from the top. Then something about napalm? Sounds a bit agit-prop. That first line repeats at the beginning of each verse, giving at least part of it the potential to appear in the title. A Track Title search for “oh well oh welcome” yielded 44 results which contained some combination of those keywords in their song titles (i.e. “oh”, “well” and “welcome” might appear in three different song titles on a given album, not necessarily all in the same song title). 2. Filter the search results to items released in a specific decade, geographic region, or genre. The OP said the tape was from the ’80s and the recording screams ’80s as well. Choosing Decade>1980 from the menu down the left side of the search window narrows it down from 44 to 7. As for genre, would Discogs have this filed under punk, funk, other? Those distinctions are subjective, which is why I opted not to use their filters for this step and instead eliminated results that obviously weren’t the genre I was looking for (i.e. skip over the items with “gospel” and “soul” in the titles, as well as the “Hot Hits” compilation. If this song had ever been a hot hit, someone would have identified it by now). That left me with only one result to investigate: Maxi Dance Pool Vol. 2 – Musikladen Eurotops. NB: Discogs, due to the way its records are structured, returned three different iterations of this same album in the search results: one being the ‘master page’ for that release/album and the other two detailing the separate formats of the release, CD and LP. All three are interchangeable for my purposes, so no need to look at each. 3. Use streaming music resources to follow leads. Given that my keywords were spread across two track titles on this compilation—”Oh Well” (by an artist of the same name), and another titled “Welcome, Machine Gun”—and that my song hardly seemed like club fodder, this was probably a dead end but I was already here and decided to see it through. The former title was a better match to my lyric than the latter so I followed the hyperlink to the Discogs page showing Oh Well’s discography. The song “Oh Well”, since it was released as a single, had its own subpage with an embedded YouTube video, a quick scan of which proved it wasn’t the song I was after. “Machine gun” didn’t appear in the lyrics of my song, so it seemed illogical to assume that the latter song had any relevance to my search. Back to the drawing board. 4. Repeat steps 1-3 as needed. I didn’t bother pursuing the words “oh well” any further because, on their own, they simply didn’t feel distinctive or interesting enough to be a title for this song. Instead, I turned my sights to “turncoat Sam.” Few writers would be able to resist making such a unique turn of phrase the hook on which to hang a song, so it had a better chance of appearing in the title. But that search yielded only two results, which were quickly ruled out. Additional searches for “turncoat” and “welcome turncoat” were similarly fruitless. Out of other options, I searched for “Sam”. Filtering down to just the ’80s still left nearly 2700 releases. Scanning the first page of 50 results, I eliminated anything immediately recognizable (e.g. T. Rex’s “Telegram Sam”), the foreign language items, the ones obviously in non-applicable genres like jazz, and ones in which Sam was inextricably paired with other words (“Play It Again, Sam”, etc.). At the bottom of the page my eye was drawn to a dark, arty record cover that seemed to fit the vibe I was looking for—what looked like a monoprint of a face that was disjointed, disfigured, with violence or chaos implied. It was for a single of a song called “Uncle Sam” by a group I’d never heard of, Rhythm of Life. Clicking through to that subpage showed that it was a UK release from 1981, classified as New Wave. On this type of page, Discogs displays suggestions of similar artists; while I wasn’t intimately familiar with the ones listed here (Josef K, Cabaret Voltaire), I knew enough to think they were reasonably aligned with my target. I searched YouTube for “Rhythm of Life Uncle Sam,” which returned one result; after a brief drum intro that was missing from the original post, there was my song. It wasn’t “turncoat Sam” after all… it was “Oh well, oh welcome to Uncle Sam”, with “to” and “Uncle” sung so close together as to sound like one word. To be fair, intuition played a part in arriving at the solution, as did good luck; if my song had appeared on the 50th page of “Sam” results instead of the first, would I have found it? (Not to mention other factors in my favor: that the song had lyrics at all, was sung in my native language, was from an era and genre of which I have a decent if not comprehensive knowledge, etc.) Still, this method has helped me solve half a dozen other mystery songs that had been plaguing people for 25+ years, where collective “Well, it kind of sounds like [artist name here]” guesswork failed. Here’s one more example off the top of my head, using the same steps—identifying the audio clues, lyrical clues, and parameters for the search. 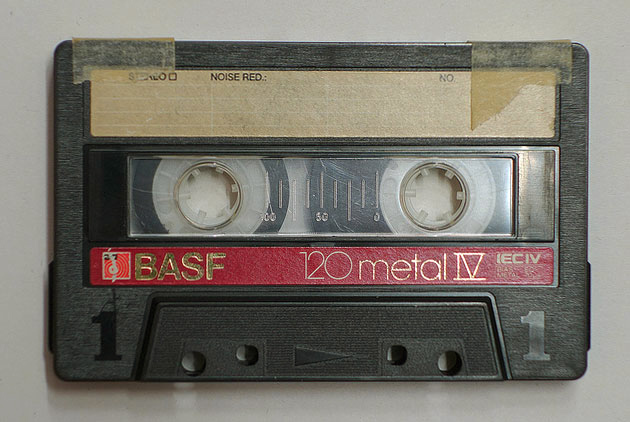 Audio clues: a song taped off an American alt radio station in 1988. The artist sounded American, slightly roots-rockish but with sonic polish, and a bit Paisley Underground. The search: the last line was the best bet. The number 35,000 spoken in that way, as its individual components, was so unusual that it took a while to realize that’s what I was hearing, as opposed to the oh-oh-ohs simply being vocal punctuations. Being catchy and unique, it was the most obvious hook. And radio being a contemporary medium, the song was probably either released in ’87 or ’88; songs generally don’t get airplay years after their release unless they’ve achieved some status. 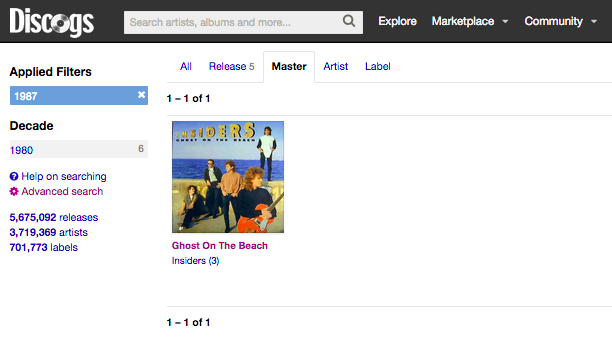 Searching Discogs in two fields—Track Title for “35,000”, and Year for 1987—took me straight to it: “35,000” by Insiders, from an album called Ghost On the Beach. I’m not surprised it eluded someone for decades; it was a deep album cut, not a single, and it’s not on YouTube, Spotify, iTunes or Amazon. 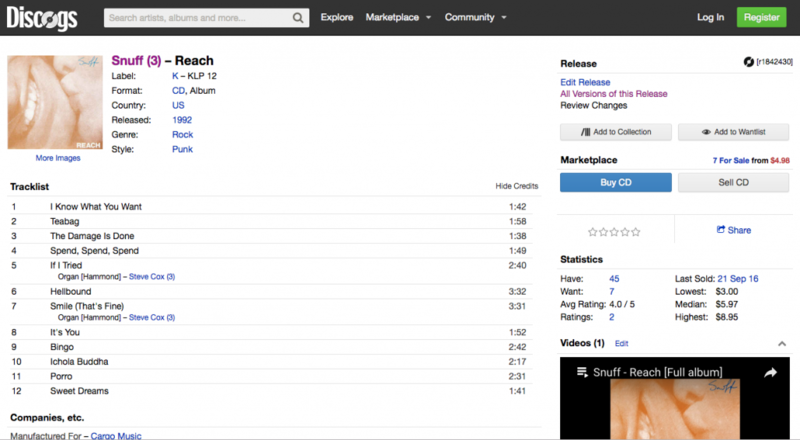 I had to track it down on (now-defunct) Grooveshark in order to verify its identity. Again, Slicing Up Eyeballs posted a reader’s plea on Facebook. NAME THAT TUNE: Scott’s having trouble tracking down a song he used to have on a mixtape. Does this ring a bell for anyone? Audio clues: none. This time there’s neither a recorded snippet nor any indication in the OP’s wording about what type of music it is. Lyrical clues: just the spoken ‘bingo’ intro. At this point, I don’t even know whether the rest of the song has lyrics or is purely instrumental. The search: I have two facts—the bingo intro and a release date no later than 1993—and one assumption: that the artist is British, since there’s no obvious reason for a non-UK artist to source a few seconds of audio from a British bingo hall. Of course there’s no guarantee that the song’s title has bingo in it, but that’s the only practical starting point. Searching Track Title for “bingo” yielded 2,848 results. I filtered those down to items released in the UK (since odds are good that an artist’s work would be released first and foremost in their native country), which narrowed the results to 562. I applied a second filter in order to see only items released in the 1990s, which reduced the results to 143. Then I clicked on the View options at the upper-right of the window to see the results as Text With Covers, which enabled me to see the release year for each item. Ignoring anything released past 1993, I worked my way down the first page of 50 results, clicking through to each item’s detailed release page and looking up songs on YouTube (if they weren’t already embedded in the Discogs page). Eventually I arrived at the album Reach by Snuff, released in 1992. Since the release page featured a YouTube video of the full album and “Bingo” was track nine of twelve, I scrubbed about 3/4 of the way into it, pausing at the gaps between songs since I was interested only in the beginning of any given track, and at the 21:32 mark is where I found my British bingo player. All told, this process took me less than 30 minutes. I thought I was done, but something nagged at me: YouTube also has a standalone video of just the song “Bingo”, and that spoken word clip doesn’t appear in it at all, either at the beginning or the end. Further, the song in that video isn’t the one following the bingo hall clip in the full-album video! After adding up the track times seen on the Discogs page, I realized that 21:32 into the album puts you at the end of “Bingo,” not the beginning of it. Therefore, if the OP is seeking the song that comes after the clip, it’s really the next track on the album—”Ichola Buddha”—that’s he’s after (and, when making the mixtape, his friend may have mistaken the bingo hall clip for the intro to that song instead of what it really is: the tail end of “Bingo”). Obviously my method is dependent on certain factors—not to mention some luck and intuition—and won’t work in every instance, but I hope it’ll be a useful tool to help you get closer to solving your own mystery song. If it does, I’d love to hear your stories about where and when you originally came by a song, where the search took you over time, and how you arrived at a solution. this is so awesome!!!!!! the mystery has been solved, and i love your play-by-play!!! so helpful!!! Superb detective work, Mark. Very much the way I approach solving stuff like this. I also lean on a big bookshelf of non-net reference material that’s quite valuable. Thank you; that’s high praise indeed. Your Punk and Post Punk Diaries are two of my favorite books. Cheers. Hello Orlando. There are probably a number of tracks from the 80s with “Feel It” in the title or chorus (like Funk Fusion Band’s “Can You Feel It”, at the link below). Can you remember the name of any song that sampled it? Brilliant!! I love that even lost songs can still be found and live on. Thanks for posting this. Awesome Post! I’ve had unknown bits of songs stuck in my head for years, and thankful for all the options you listed in helping me find the artist/title!!! Forgive my contrariness here–but you could save yourself all of this legwork, and play back the song in question (if you have a recording of it) to an app on your smartphone like Shazam or SoundHound, which will automagically recognize and tell you what song it is. Works 8-9 times out of 10 for me, but these steps in this article are good if it’s a tune that stumps those apps. it says in the VERY FIRST paragraph that those apps didnt get anything up. You’re right–I missed that when I first read, or should I say, casually skimmed through this article initially rather than read it word-for-word. I stand corrected. I find this sort of detective work to be utterly fascinating. Thanks for sharing it. Making it a bit hard. If you have bits of the lyrics figured out it’s quite easy to search those “within quotes” and just add the word lyrics. Not every song in history has it’s entire lyrics posted online. Have searched everywhere for an old song we had on a record when we were kids. I believe the name of the song was “Boobalac. Not sure of the spelling. It was about a bird named “Boobalac. Some of the lyrics were “itty bitty bird they call him a Boobalac. Another part said some thing about him being “high up in a cottonwood”. The main chorus said “Boobalac, Boobalac, corn’ll make a Boobalac tweet. Boobalac, Boobalac, now ain’t a little Boobalac sweet. Please Help. I wasn’t going to comment but it seems you’re still here! You’re kinda my only hope, I can’t figure this out. I HAVE the song. What I don’t have is any way of identifying it … there’s a clip of it here. It doesn’t have lyrics, only “Go”, a couple of words, and a sentence half way through that I can’t hear (sounds like something other than English). It sounds kinda trance-y, and seems as though it gets cut off before the end … I’ve got nothing else to go on. I’d appreciate any help! Never mind – just as I posted this, I actually found it using some of your methods. More like, I kinda stumbled on it, but either way, success!! Thank you so much for this post! Hi Yuki. This post gets a lot of views but most people never let me know how their searches turned out, so I appreciate the feedback and knowing that I’ve been of some small help. I’ve been trying to find a song for years that i always thought was (Noosha) Fox, either as a band member or solo artiste, i’ve trawled through all the stuff of theirs (and hers) i could find, but have drawn a blank!